GE Aviation announces plans to create adjacent factories in Huntsville, Alabama, to mass-produce silicon carbide (SiC) materials used to manufacture ceramic matrix composite components (CMCs) for jet engines and land-based gas turbines. GE Aviation will invest more than $200 million to construct two factories on 100 acres in Huntsville. When the factories are operational later this decade, they are expected to employ up to 300 people. Earlier today, GE Aviation’s Sanjay Correa, Vice President, was joined by Governor Robert J. Bentley and members of the Alabama delegation at the Alabama State Capital in Montgomery to make the announcement. 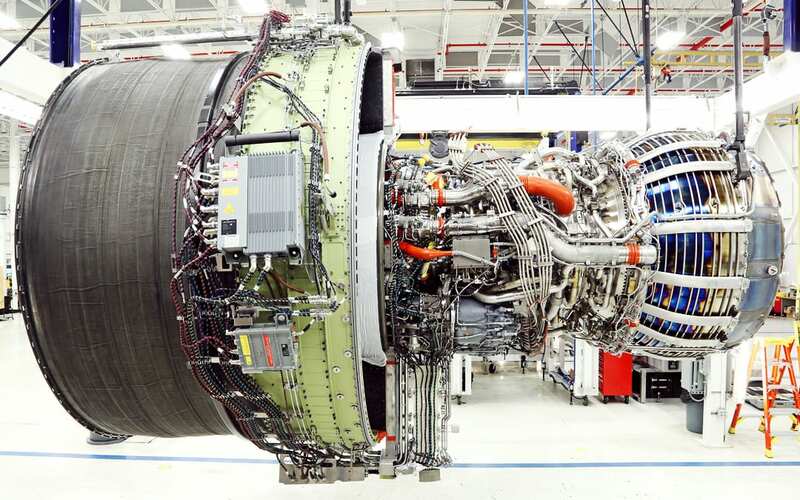 “Establishing the new GE factories in Alabama is a very significant step in developing the supply chain we need in order to produce CMC components in large volume,” said Sanjay Correa, Vice President, CMC Program at GE Aviation. One plant will produce silicon carbide (SiC) ceramic fiber. It will be the first such operation in the United States. Today, the only large-scale SiC ceramic fiber factory in the world is operated by NGS Advanced Fibers in Japan, which is a joint company of Nippon Carbon, GE, and Safran of France. The adjacent GE factory will use the SiC ceramic fiber to produce the unidirectional CMC tape necessary to fabricate CMC components. Construction of the two plants will begin at about mid-2016, with full completion by the first half of 2018. Production begins in 2018. GE has already begun hiring the technical team that will transfer to the Huntsville operation. GE expects to begin hiring the hourly workforce in late 2016. The use of lightweight, heat-resistant CMCs in the hot section of GE jet engines is a breakthrough for the jet propulsion industry. CMCs comprise SiC ceramic fibers in a SiC matrix, enhanced by proprietary coatings. With one-third the density of metal alloys, these ultra-lightweight CMCs reduce the overall engine weight. Further, their high-temperature properties greatly enhance engine performance, durability, and fuel economy. CMCs are far more heat resistant than metal alloys, hence requiring less cooling air in the engine’s hot section. By using this air instead in the engine flow path, an engine runs more efficiently. For more than 20 years, scientists at GE’s Global Research Centers and GE’s industrial businesses have worked to develop CMCs for commercial applications. The best-selling LEAP engine, being developed by CFM International, the 50/50 joint company of GE and Snecma (Safran) of France, is the first commercial jet engine to use CMCs in the high-pressure turbine section. The LEAP engine, with more than 9,500 orders and commitments, is currently completing certification testing. It is scheduled to enter airline service next year powering the Airbus A320neo, and in 2017 powering the Boeing 737 MAX. Ceramic Fiber Plant. Supported by funding ($21.9 million) from the U.S. Air Force Research Lab Title III Office, this plant will dramatically increase U.S. capability to produce SiC ceramic fiber capable of withstanding temperatures of 2400F. The SiC ceramic fibers plant will license fiber-producing technology from NGS Advanced Fibers Co. in Japan, a joint company formed in 2012 with Japan’s Nippon Carbon (with 50% ownership in NGS), GE (25% ownership), and Herakles Safran France (25% ownership). NGS, which already produces SiC fibers for GE’s CMC components, is establishing a second factory in Japan to increase capacity to meet growing demand. The GE fiber plant in Huntsville will complement the growing capacity at NGS. Once the Huntsville plant is operational, it will sell fiber to the Department of Defense, GE businesses, Herakles (Safran), and other outside customers subject to U.S. regulations. It will be the first U.S.-based factory to produce SiC ceramic fiber on a large industrial scale. The two other NGS partners will ultimately have the opportunity to become equity partners in the Huntsville plant. CMC Tape Operation. This adjacent plant, financed solely by GE, will apply proprietary coatings to the ceramic fiber and form them into a matrix to produce CMC tape. The ceramic tape will be used by GE Aviation at its new CMC manufacturing site in Asheville, N.C., which opened in 2014. The Asheville facility fabricates CMC shrouds for the LEAP engine’s high-pressure turbine section. In addition, GE’s Power and Water business is testing CMCs in its newest and most efficient, air-cooled gas turbine. At GE Power and Water’s new Advanced Manufacturing Works facility in Greenville, SC, prototype CMC components are being built to replace super alloys in large gas turbines. The demand for CMCs is expected to grow tenfold over the next decade. Each LEAP has 18 CMC turbine shrouds, which are stationary parts in the high-pressure turbine that direct air and ensure turbine blade efficiency. Also, CMCs are being used in the combustor and high-pressure turbine section of the new GE9X engine under development for the Boeing 777X twin-aisle aircraft. Almost 700 GE9X engines are on order today, with the aircraft entering service by 2020. GE is incorporating CMC components in advanced military engines including the GE3000 for the U.S. Army. GE’s advanced turboshaft demonstrator FATE (Future Affordable Turbine Engine) also for the Army increases the use of hot-section CMCs to achieve aggressive fuel efficiency, power-to-weight ratio, and lower maintenance cost goals. CMCs are currently being evaluated for upgrades to existing engines like the highly popular T700 helicopter engine. Today’s announcement represents GE Aviation’s second significant factory investment in Alabama in recent years. Since 2013, GE Aviation has also invested more than $100 million in a 300,000-square-foot factory in Auburn, near the storied Auburn University campus, where the company is engaged in jet engine component manufacturing (super-alloy machined parts) as well as establishing the world’s highest-volume additive manufacturing center. Over the past year, the Auburn plant has been installing and qualifying additive manufacturing capability, including more than a dozen laser melting machines. Fuel nozzles will be the first components to be built using additive processes for the best-selling LEAP engine by CFM International. It marks the first time such a complex component will be manufactured using additive technology.